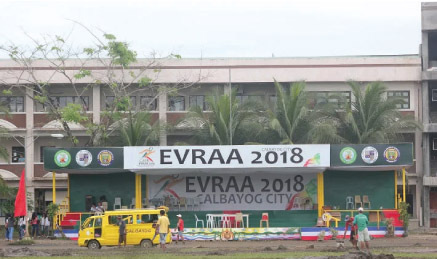 CALBAYOG CITY- More than 8,000 student-athletes across the region are to plunge into actions as this year’s Eastern Visayas Regional Athletic Association (EVRAA) Meet is to begin on Sunday (Feb. 4) in this city. Delegations started arriving here since January 30 for purposes of familiarization of the playing venues. 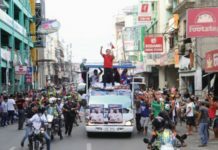 The regional sporting event will start with a thanksgiving mass and a press conference in the morning, with the parade and opening ceremonies in the afternoon to be held at the grounds of the Northwest Samar State University. More than 400 police and soldiers are to be deployed in the streets and in all billeting areas to ensure the safety of the delegations and the visitors during the entire EVRAA Meet staging. Almost 4,000 students and teachers are to perform the unity dance, drum and bugle corps and grand chorale during the opening program. This is the third time Calbayog City will host the regional athletic event, the last one in 2011. Raul Agban, city schools division superintendent, is hopeful that this year’s staging of EVRAA in this city will be successful just like its previous hosting. “DepEd worked hand in hand with the local government of Calbayog, for our successful hosting of EVRAA because the hosting is not only for DepEd but for the entire city,” he said. Education Assistant Secretary for Procurement, Project Management, and Field Operations Revsee Escobedo will be the guest speaker during the opening rites. Samar Rep. Edgar Mary Sarmiento(1st district) and City Mayor Ronaldo Aquino are to welcome the delegations from all over the region. Classes in the entire city will be suspended starting February 5 to give the students opportunity to witness the different sports events. Teachers were also assigned to extend assistance to each delegation. For the staging of the 2018 EVRAA Meet, the city government allocated P35 million. “We made sure that everything is prepared for this year’s EVRAA Meet in Calbayog,” City Mayor Aquino said. The city assigned a medical in each delegation to look into the health of the athletes. Aside from the military, personnel from the Philippine National Police, Coast Guard, Calbayog Public Order and Safety Office, and City Disaster Risk Reduction and Management Office will look into the security and orderliness in all the billeting venues. Meanwhile, Rep. Sarmiento commissioned motorized cabs locally known as “timbol” or “taxicol” to ferry members of the delegations or those who will witness the sports events in the different playing venues. “We want the members of each delegation coming from the different parts of the region feel at home in our city. By giving them the free ride is one way of making their stay in Calbayog easy for them in going to different playing venues,” the solon said. Meantime, city and provincial tourism offices will also join this year’s EVRAA Meet. Tourism Expo is set to open on February 5 showcasing the different tourist destinations in the region. “We are happy that the city and provincial tourism offices of each delegation has responded to our invitation to join the Tourism Expo,” city tourism officer Ronald Ricafort said. Ricafort also added that their office will give a P50 discount to members of the delegation who will ride the zipline. Meanwhile, more than 400 police and soldiers are to be deployed in the city during the entire staging of the EVRAA to ensure the safety of the delegates and the visitors. “Together with our counterparts coming from the AFP, Coast Guard, we will make sure of the security of our delegates,” P/Supt. 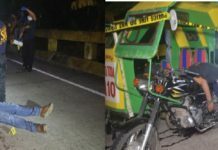 Jose Junar Alamo, Calbayog City police chief, said.